Home » Featured » Have you seen this kit? 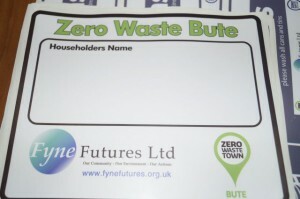 Our Tenement Recycling Trial is underway with 2 collections already made. Early days yet, however we have seen an increase in the volume of recycling materials. The number of households getting involved as increased. There has been a small amount of contamination as people learn what good recycling practice looks like. An especial thanks to neighbours at 68-70 High Street, many new participants and good quality recycling. The kit we are testing there is called a “Node”. It is made up of 4 large units, with clear messages of the materials in each unit, that fit together and is suitable for a site where space is not a barrier. Householders have green bags and bring their recycling down for separation at the unit. 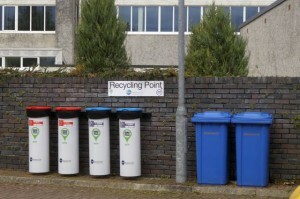 Meanwhile in Russell Street, a number of blue bins have been set up to create 4 communal recycling points. The blue bins are labelled for different types of materials. The green bins are clearly marked as landfill bins. There have been a few challenges at Russell Street, as residents need to navigate around the scaffolding but people are getting to grips with the system. The small Springfield estate gave us an opportunity to trial a different solution. Here a system known as “Orbis” is being used. It has a small footprint, very neat, and would seem to be ideal for situations where space is limited. Neighbours in Mill Street are testing a system called “3-box stack”. 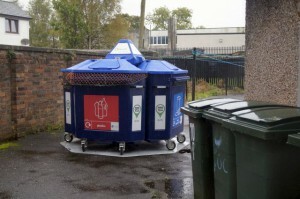 This system is slightly larger than a wheelie bin and is made up of 3 boxes, 1 for each type of material. The system is suitable for individual households or can be shared by neighbours on the same landing. Check back with us for updates and how the trial is progressing.